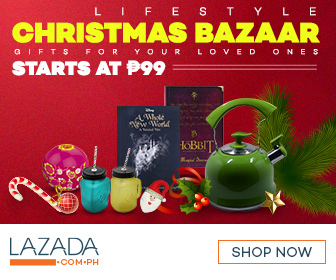 Other than paying Lazada.com.ph for items you've purchased, how about making money out of the site? Here are two ways you can earn money through the website. If you're not new to the world of online selling, becoming a seller at Lazada won't be problem. All you need to do is to signup and follow the instructions which will be sent at your registered email. Lazada only charges you whenever a product you've displayed on their site is sold. There are requirements that need to be fulfilled though which include a DTI and BIR registration. You will also need to attend a training at their main office. The prerequisites needed ensures that the site remain scam free and that only legit sellers offer products on the site. You can earn up to 10% commission per sale by becoming a marketing affiliate. All you need to do is to apply if you have a blog or website or even social media pages to use when promoting banners or links from Lazada. After your application is approved, you can start posting banners or links with tracking attached to your ID and earn a commission every time a sale is made through your link. I am applying for the affiliate Program at Lazada and is almost new to the Blogging World where earning is involved. Are there any tips you could suggest? There are materials and resources you can read within the Lazada website as soon as your profile is approved to help you. I think you will earn if your site have enough traffic and getting traffic to your site or blog is very steep, you need to spent money for the traffic, tweaking your site seo and other internet marketing strategy this is so hard to do but if your willing to make all these efforts, then the reward is great also. Why I can't still log in on my account, I have signed up last April 21, and it is always said that my account is pending. How long does the activation of my registration counts? What program did you sign up for? The affiliate? It will take a while and an actual Lazada representative will contact you via email for details. Signing up with Lazada Affiliate requires a company. How do I even deal with that if I don't have one? Do you have a blog/website? You can use that as company. That worked for me. ilang attempts po ggwin ng lazada para masabi cancel ang order salamat. ilang attempts ggwin ng lazada para masabi cancel ang order salamat? I have no idea eh. In most cases naman, hindi na nila need mag-verify. Hi how to join as an affiliate? Can u give me some link? Legit products??? I onces bought a product on sale so it is eye catching but when it is delivered I noticed it was fake or imitation...pls check for fake pruduct details.. It may help to compare with the real prices in malls or the product's website. If it's too cheap, it's probably just an imitation or what they call Class A type. How long it takes before we can claim our Commission via BPI? Being an affiliate can i post products from my links to my websipe and sell it to my customers using my personal tracking link in my lazada app? Of course you can. You may want (if you'd like) to disclose affiliation too. What is conversion? It is the earning from the impression and click or it is an earning from the sales? I got confused. Because my impression and click turned negative percent so my conversion 1 instead of 2,and my payout become $7.57 instead of $8.53? So my payout amount will affected if my impression and click become negative percent? Don't worry about the impression. It's the conversion that matters for earnings. Tried this Lazada affiliate. Up to now still havent made much from it. Well, I guess its a free start-up also. You need to seriously work on the strategy/marketing if you'd like to earn, specially for sites that don't have enough traffic yet. What is payout (ytd) ? and pending conversions? i didnt earn a single cents even if i directed them a big traffic to lazada website? hi! thanks for your article.. nakakuha ako ng tips.. very well written also. Keep the blogs coming!